Active use of solar energy means by itself use of mechanical or electric adaptations for transformation, transfers and distributions of solar energy. Examples of such use are гелиосистемы and photo-electric installations. Passive use of solar energy is meant as a number of constructive and architectural principles of construction of a building allowing to balance energy needs. Windows, walls, a floor and a roof of the passive house the maximum absorption, storage and distribution of solar energy during the heating period is projected in such a manner that to provide and to protect a building from sunlight during the summer period. We will stop on principles of passive use of solar energy in construction in more detail. The correct orientation of the passive house is necessary for the most effective use of solar energy on parts of the world. The house facade, as a rule, is guided in the southern direction and should not be shaded by trees or other designs. orientation of the passive house on parts of the world From the South settles down the maximum quantity of svetoprozrachny protections which would pass beams of winter low sunlight in a building. On the northern party of a building the quantity and the area of windows should be minimized or at all be absent. 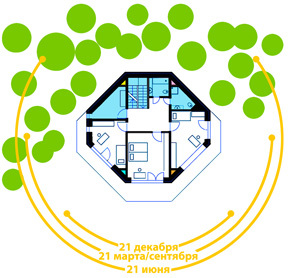 The scheme of hit of beams of the sun in the passive house Summer солнцезащита is realized at the expense of installation of additional designs in the form of bay windows, eaves, terraces, balconies. It allows to shade svetoprozrachny protections, and interfere with hit to beams of the summer sun in a building. Thus, at observance of other criteria of construction of the passive house, solar energy in the winter can be enough for maintenance of comfortable temperature in the passive house. Especially it is actual in frosty days when, as a rule, the sun shines quite intensively. During the summer period protective designs interfere excessive accumulation of solar energy.